The Astronomical section of the Museum of the Sky and the Earth contains the third largest Planetarium in Italy, the Astronomical Observatory, a meteorological station and a museum with an important collection of meteorites. The municipal observatory Giorgio Abetti, besides the Planetarium, is equipped with a telescope. Communication and education are the main functions of the Observatory. 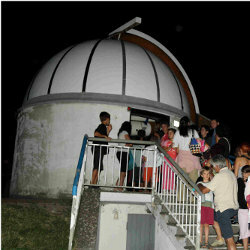 In recent years there have been thousands of visitors, who have watched the sky through the eyepiece of the instrument. The telescope is housed in a dome of 4,5 metres. Through it you can observe shadows and craters on the Moon, the phases of Mercury and Venus, the frozen poles of Mars and details on the Saturn rings. The observatory contains also a heliostat, that is an instrument to observe the sun and that makes clearly visible flares and sunspots. The Museum of the sky and the earth includes, in addition to the natural and astronomical area, Tecnoscienza (a section of the museum of the Department of Physics of the University of Bologna) and the area of ecological balance called Bora. - Observatory, Botanical Garden, Natural Areas and Ecomuseum of Water: free entrance.